The process of cheese making ranges from short and simple, to lengthy and somewhat complex. Regardless of the exact variations required to produce individual types of cheese, however, the basics of cheese making remain the same. Cheese, of course, is made from milk. The most popular types of milk for cheesemaking include cow milk, goat milk and sheep milk. Each kind of milk imparts a unique flavor and texture to the resulting cheese, and some cheeses are strongly associated with a particular kind of milk, such as goat milk with chevre and sheep milk with romano. Despite these traditional associations, however, the basic process of making cheese remains the same across milk varieties, as the compositional structures of the milk are similar. Cheese, also known as curds, is composed of the solid portion of milk, which contains fats and proteins. The proteins in milk consist of two types: casein and whey. Casein comprises about 80% of the protein content and is of a solid nature, while whey makes up the remaining 20%, and is in liquid form. The first step in the process of cheese making is to separate the solid casein from the liquid whey. The solid and liquid portions of goat milk normally remain homogenized. However, if the pH of the milk is lowered to an acidic level, the solids and liquid portions of the milk will separate or "curdle." The image to the right shows this separation in milk that has been cultured with kefir grains. I'm sure at some time in your life, you've seen curdled milk--either from a forgotten half glass of milk found a day (or weeks...) later, or from trying to add milk to a cooking recipe that was too acidic (sometimes, even coffee). Well, those disgusting chunks in the milk glass, or white dots floating in your coffee, were cheese. There are two basic ways to acidify the milk: (1) by the addition of an acid, such as vinegar or lemon juice, or (2) through the use of bacteria. The use of vinegar and lemon juice has a long history of use in cheese making at home for producing soft, fresh cheeses, such as ricotta cheese. This method of acidification is really only suitable for soft cheeses, as it produces a very small curd size. Most cheeses are produced from milk using bacteria to precipitate the curd. This is accomplished when the bacteria ingest the milk sugar lactose, and convert it into lactic acid. The milk is first warmed slightly to produce conditions that are favorable for the bacteria to thrive. Bacteria can be introduced in the process of cheese making through the use of Direct Vat Innoculation (DVI) or with a mother culture. DVI cultures are commercial powder preparations containing live bacteria that are introduced directly into the warmed milk. Each DVI packet is used to make one batch of cheese. Mother cultures, on the other hand, are made from milk that has been previously cultured with the desired bacteria. Mother cultures have their name from the fact that small amounts can be used to re-culture additional milk, so that the culture replenishes itself naturally. 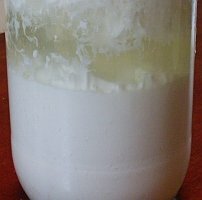 For cheese making at home, mother cultures often consist of yogurt or buttermilk. The longer the bacteria are left to act upon the milk, the more acidic the solution becomes, producing firmer curds. In fact, the bacteria continue to act slightly as hard cheeses are ripened, reducing the lactose in these cheeses to about 5% or less than that found in milk. This is why hard and semi-hard cheeses are recommended as a viable alternative dairy product for those with lactose intolerance. If a firm or hard cheese is to be produced, rennet is also added at this point in the process of cheese making to further coagulate the curds. 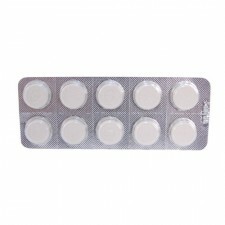 Rennet comes in tablet, powder and liquid forms, and is available from animal and non-animal sources. 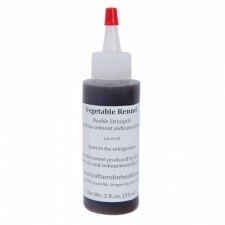 All types of rennet are suitable for cheesemaking. You may wish to try different ones to see if you have a preference. After the milk has been sufficiently acidified, the whey is drained from the curds through cheese cloth. Traditionally, the curds are gathered in a ball in the cheese cloth, and hung to drain. 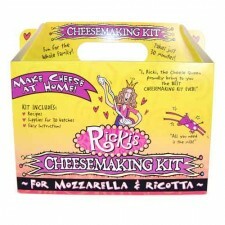 This process can take from a few hours up to 24 hours, depending upon whether a moist or a firm cheese is to be made. For soft cheeses, the curds are then collected from the cheesecloth, and non-iodized salt and/or herbs are mixed in, if desired. Fresh cheeses are stored covered in the refrigerator and usually remain good for 1-2 weeks. 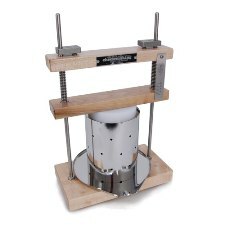 For hard cheeses, the next step in the process of cheese making includes pressing the salted curds in a cheese press, like this one from Cultures for Health, to drain any remaining whey and to produce a single, formed mass of cheese. Varying weights and times are used during pressing, depending upon the type of cheese being produced. After pressing, the lump of cheese is typically air-dried at room temperature for several days. Often, salt is added to the exterior during this time to aid in removing the remaining moisture. Some hard cheeses also receive special treatments with herbs or other flavoring agents to produce a unique taste. For example, drunken goat cheese (below left), is soaked in a wine "bath" that gives it a fruity taste and beautiful purple rind, and Ibores cheese (below right) is rubbed with paprika. When the cheese is sufficiently dry, it is coated with cheese wax to protect it, and aged for a time period ranging from several weeks to several months. The longer the cheese ages, the sharper the resulting taste. During the aging period of the process of cheese making, the temperature and humidity have to be closely monitored and maintained. Most cheeses are aged at between 50° and 60° F, but the requirements vary somewhat with different varieties of cheese. For ripened and molded cheeses, such as camembert, brie and blue, bacterial/mold solutions are sprayed on the exterior, mixed into the curds, or injected into the cheese during the aging process. The resulting action of the microorganisms on the cheese as it ages results in a distinctive appearance and taste. For example, brie and camembert (shown below) develop a fluid consistency with an earthy flavor and a firm outer rind as a result of an application of penicillium candidum to the exterior. Blue cheese, on the other hand, develops distinctive blue streaks or spots throughout the cheese from the addition of penicillium cultures to the curds. 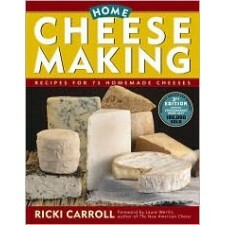 If you're ready to learn more about making your own cheese, consider adding Home Cheese Making by Ricki Carroll to your library. This is one reference book that I turn to quite often for cheesemaking advice. Want to keep things simple? A cheese starter kit has everything you need to make multiple batches of perfect cheese, and there are thirteen different kits to choose from! Whether cheese is made in small batches at home, larger batches in an artisanal shop, or in a modern commercial factory, the basic process is still the same. Science and technology have helped formalize parts of the process and tremendously aided the ability to produce consistent results in taste, appearance and texture. However, at its core, the process of cheese making remains an artistic endeavor that's best pursued by those who are experts in the the final stage--cheese eating! Read more about the characteristics and varieties of Goat Cheese, or take a look at Goat Cheese Making Recipes if you're ready to try your hand at making your own goat cheese! Articles are updated frequently, so check back here for any new information on the process of cheese making!